Best Airfares to Brunei Darussalam! Brunei is located in the north part of Borneo. The state religion of Brunei is Sunni Islam. The nation is home to a biodiverse rainforest. Passengers visiting Brunei must hold a valid passport and a visa. There are some visa-exempt countries, mostly from European and Asian countries, who can visit for 14, 30 or 90 days without a visa. Other nationalities are required to have a visa for Brunei issued in their passport either on arrival (Saudi Arabia, China) or ahead of their visit to Brunei by one of Brunei's diplomatic missions worldwide. Airlines and air ticket agencies should be able to further advise on this issue as well as the requirement of a return ticket (or outbound ticket) to/from Brunei. Travelers are allowed to bring 2 liters of spirits or wine and 12 cans of beer to Brunei. I traveled on a return ticket from Dubai to Brunei for a business trip, and I purchased the ticket through Emirates Airlines. This ticket was expensive, but I needed to be in Brunei on a certain date, so I bought this ticket instead a cheaper ticket to Brunei with a layover in India. Emirates Airlines are known for their great service, and good vegetarian food was included in the price of the airfare ticket onboard. I spent most of my three days in the capital city of Brunei and the surrounding area. Without a ticket going via India, I would have flown in later and not had enough time to tour Brunei's capital. I fell in love with Brunei and its culture, and I would have had much less time in Brunei if I had only been focusing on the price of a ticket. I won a return flight ticket to Brunei in a tombola at an event organized by the Brunei embassy in China. Having won this ticket, I booked a hotel and decided to explore and discover Brunei in five days. The ticket was issued with China Airlines: the service was quite good even though it was just a standard second-class ticket. My journey started in Beijing on a direct flight to Brunei; the ticket entitled me to a short-term visa which I collected at the airport. Once I had landed, I bought a ticket for the famous water taxi to get to Brunei's capital, which was where I spent most of my time in Brunei. With a five day ticket, I was able to board all public transport, which is very reliable in Brunei. Q. I want to visit Brunei and Malaysia. Can I travel to Brunei from Malaysia by bus? A. Yes, you can travel from Kota Kinabalu to Brunei by bus. The bus ride to Brunei's capital will take about 5 hours and the ticket can be purchased from the Kota Kinabalu's main bus station. You can also purchase them at ticket agents throughout the city. Q. Do people in Brunei speak English? A. In Brunei, a number of languages are spoken. The official languages of Brunei are English and Malay. Young people in Brunei are very likely to speak English fluently. Q. What are the highlights of Brunei? A. Brunei is a very interesting country to visit. Even though Brunei has been always been known for economic successes, it is also a country that has a lot to offer to tourists. 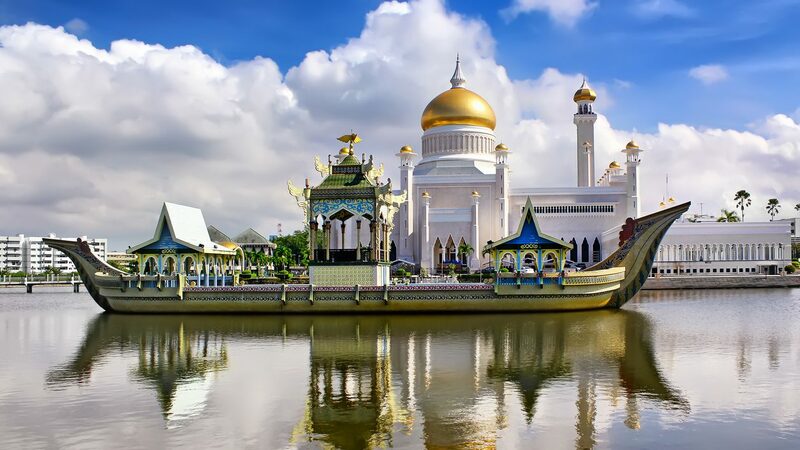 The most interesting sites in Brunei include the architecture of Brunei's capital as well as the markets in smaller towns, and the overall natural beauty of the country. Brunei has forest reserves and well-developed ecotourism. When in Brunei, you should not miss the Brunei River and the unique water villages. Airports handling direct flights to Brunei International Airport ・Singapore Changi Airport ・Kuala Lumpur International Airport ・Dubai International Airport etc. There are direct flights to Brunei from Dubai, Singapore, Kuala Lumpur and other Asian destinations. The national airline of Brunei, the Royal Brunei Airlines operate flights to Asia and Europe. It is necessary to travel on a return ticket if flying to Brunei from abroad. An onward ticket to other destinations from Djibouti can be purchased at the Djibouti City Airport.